There is only one festival in existence on which people from all over the world get a holiday; Christmas! Christmas is one of the major catholic festivals and is the celebration of the birth of Jesus Christ. It is a shortened word for Christ’s Mass. It is celebrated on the 25th of December and is a universally accepted holiday. Christ’s Mass marks the beginning of the holiday season, which spans 12 days, from the 25th of December to the 7th of January. The Philippines has the longest holiday season which can start from as early as September and extend to the 9th of January. The Christ’s Mass season is a time of joy and comfort where kids, adults and the elderly all alike look forward to celebrating the joyous occasion. Usually schools, colleges and offices remain closed at this time of the year. Families get together to share the festivity and exchange good wishes. The story of Christmas can be traced back to the New Testament of the bible. It involves the birth of Jesus Christ. He was born in a manger as his parents, Joseph and Mary, could not find a room to stay in the biblical town of Bethlehem. He was given the name Jesus after the angel Gabriel appeared to Mary in a dream, saying that she was chosen to bear the son of God. After his birth, the North Star guided three wise men, who were traveling in the desert and lead them towards the manger. The men brought gold, myrrh and frankincense as a gift for baby Jesus. Angels guided the nearby shepherds who came and worshipped new born. Although the exact month and date of his birth are unknown, 25th December was universally accepted as Christmas Day. 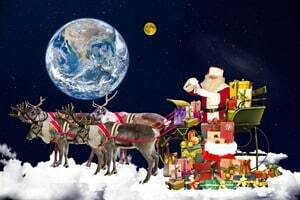 Christmas is widely celebrated across the world. Santa Clause, is the fabled personification of Christmas, is an important symbol of the festival. He is imagined as a cheery old man, who rides a sleigh and delivers gifts to children all around the world in a single night. It is an important part of the year for Christians, as they decorate their houses with attractive lights and ornaments. The Christmas tree is a prominent decoration for Christmas and it involves the decorating a pine or a spruce tree with lights and goodies. Medium sized trees are used for indoor decoration though nowadays, artificial trees are also available and are used to reduce costs and save the environment. The Christ’s Mass is attended on the Christmas Eve, where everyone dress up in their best clothes and head to church. Carols are sung and coir groups parade through the streets, going house to house singing melodious Christ’s Mass hymns. Christmas morning is particularly eventful, since it is the time when Christ’s Mass presents are exchanged. Presents are a major tradition of the Christmas festival and every member looks forward to it with glee. Christmas is also a major festival even when the commercial sector is concerned. Since it is celebrated by a vast amount of the population, businesses take advantage of the holidays and come up with massive sales. The Christ’s Mass shopping is another major tradition of the festival and families spend a good amount of money on decoration, clothing and other goods. Christ’s Mass presents are another major area of public expenditure. Christmas also encourages charity work, as churches and other organizations hold Christ’s Mass auctions and donation drives for the help of the unprivileged. Donations are distributed to orphanages and old age homes and church groups visit these places to spread love and joy of the festival. Christmas has had an on the entertainment industry as many of the films, movies and other media have been inspired by Christmas stories. Movies have special Christmas releases to increase their chances of success. The festival of Christ’s Mass is not limited to Americans or Europeans, since people from every ethnicity and culture celebrate it. People of every religion join for the Christmas celebrations and contribute to the immense spirit of Christ’s Mass. It is a season of happiness and thanksgiving, where old grudges are forgotten, new friendships are forged and relationships are materialized. It is a festival that brings people together and promotes a sense of love towards one another. People celebrate this festival not only because of their faith, but also because of the joy and satisfaction it provides the soul. It is one of my favourite festival and I love to celebrate it.